Principal Cast : Kevin Costner, Whitney Houston, Gary Kemp, Bill Cobbs, Ralph Waite, Tomas Arana, Michele Lamar Richards, Mike Starr, Christopher Birt, DeVaughn Nixon, Tony Pierce, Gerry Bamman, Joe Urla, Charles Keating, Nathaniel Parker, Richard Schiff, Robert Wuhl, Debbie Reynolds. Synopsis: A former Secret Service agent takes on the job of bodyguard to an R&B singer, whose lifestyle is most unlike a President’s. 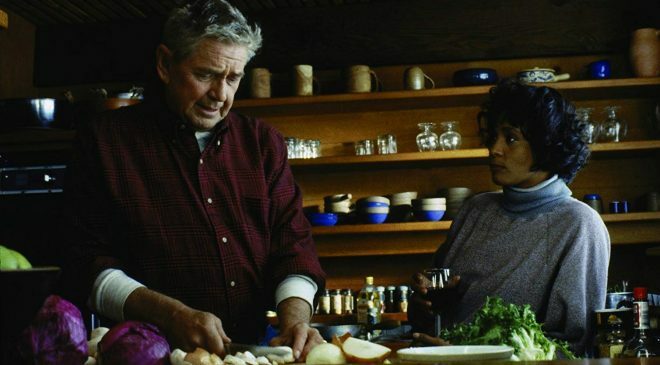 When he’s not writing Star Wars films, Lawrence Kasdan made a buck scripting cheesy romantic musical-thrillers, a subgenre not too often mined these days for box-office dollars. 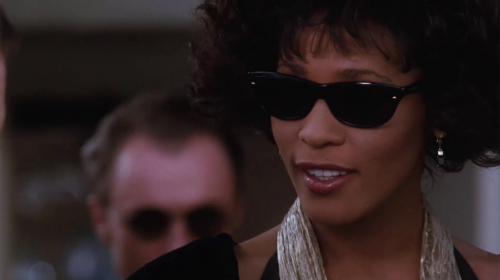 The Bodyguard, in which superstar singer Whitney Houson makes her acting debut, alongside a dour-faced Kevin Costner, met with critical malaise but generated a crowd-pleasing soundtrack and subsequent commercial success in spite of itself. Retrospectively, the film is an absolute blast of 90’s-era romantic hokum, a tepid stalker subplot valiantly trying to insert itself into the Costner-Houston romance the film was sold as. Realistically, The Bodyguard is absolute trash of the first order, a mish-mash of silly dialogue, predictable plotting and a supporting roster of pleasant quality. Musical superstar Rachel Marron (Houston) has just been nominated for an Academy Award in the Best Actress category, although unbeknown to the public she is also the target of a stalker, a stalker who is sending her death threats. Her security manager, Bill Devaney (Bill Cobbs) hires professional bodyguard (and former Secret Service Agent to President Reagan) Frank Famer (Costner) to protect her. Initially resistant and combative to the increased intrusion into her life, Rachel and Frank do not see eye-to-eye about her protective detail, until a close encounter brings them closer together. As Frank becomes increasingly paranoid about the stalker’s true motives, and the Oscars draws ever closer, their bond will be tested as Rachel’s diva-esque behaviour threatens to bring her into immediate danger. 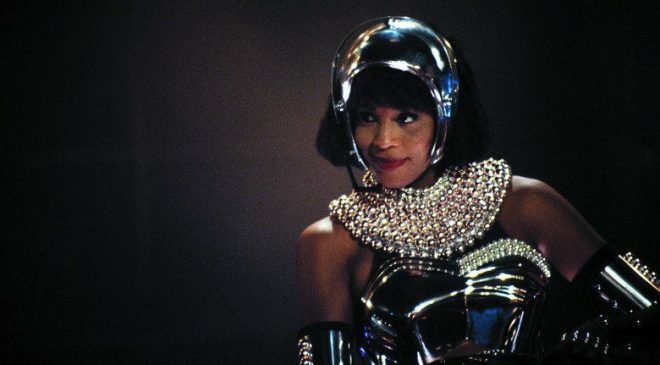 The Bodyguard is purely a vehicle designed to capitalise on the popularity of Whitney Houston. The singer, who is essentially playing a fictionalised version of herself, makes her big-screen debut and her lack of experience shows; Houston isn’t as awful as the Razzie Award nomination she received might suggest, but she’s not great either. When she sings, though… holy hell, it’s like angels have opened up a direct line to heaven. Costner, once more his stoic, hard-faced self, is gratingly bad – he’s terrible in this role, let’s be honest – and the chemistry between both he and Houston is the very personification of a “charisma vacuum”. Whenever Houston is on screen, the film lifts, and when she’s not (which, thankfully, isn’t that often), The Bodyguard flails badly. The film’s screenplay famously languished in development hell after originally being written for Steve McQueen and Diana Ross, who were attached to the project as far back as the 1970’s. The script was Kasdan’s first, and he would also famously go on to co-write a couple of Star Wars films for George Lucas. The Bodyguard’s cheesy plot and malignant dialogue is tin-eared by today’s standards, a tone-deaf playbook of diva demands and second-rate romance, as unlikely as it would be. The film is flat-out silly – at one point, Frank tucks Rachel into bed like a doting dad, which is both creepy and entirely un-romantic – and juxtaposes its lightweight love story with a sinister undertone of danger that becomes hysterically violent for no good reason later in the film. 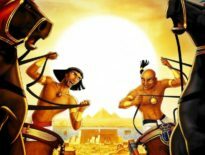 It’s a film of competing tone, really, in that the romance and the elements of danger never quite work together like they ought, leaving much of the film’s intended interest decidedly not so. Also problematic is the direction by British helmer Mick Jackson. Jackson was riding a crest of Hollywood courtship during the early 1990’s, bringing films such as LA Story and Chattahoochee to us before succumbing to the mediocrity of Volcano and Dana Carvey’s Clean Slate, among others. Jackson’s work here is commendable but entirely lacking in energy, as if he too was confused about exactly what kind of film this was trying to be. His camerawork indicates a sense of intimacy between Costner and Houston through a lot of closeups, but incoherent editing of concert sequences and the climactic Academy Awards finale forces a lot of expected tension to evaporate. It doesn’t help that the film’s cinematography, by celebrated DP Andrew Dunn, feels cloyingly oversaturated and gritty, a byproduct of early 90’s style, and rooted deeply within this neon-infested mess is romance that misfires badly. The Bodyguard gives Houston plenty of opportunity to warble her greatest hits, and in these moments it’s little wonder the music industry regards her sudden passing with such sorrow: her talent was immense, and the film’s soundtrack remains a legitimately iconic entry into that decade’s film-borne hit parade. Tunes like “I Will Always Love You” and “I Have Nothing” have become synonymous with the film, and oft-covered on talent shows and karaoke nights, so I guess if we’re thankful for this film’s existence its that, right? 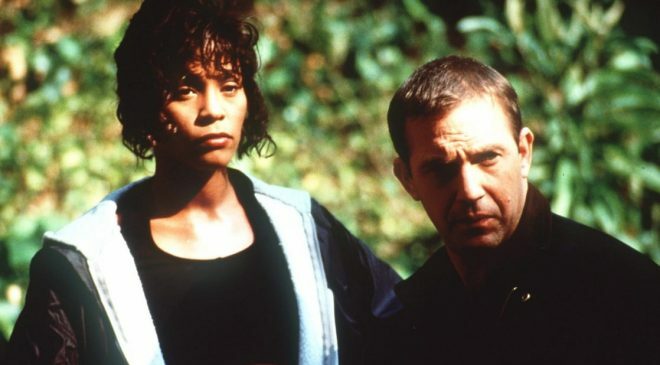 Otherwise, The Bodyguard is a so-bad-it’s-good nostalgia hit that misses more than it hits, led by an inordinately wooden Costner and an earnest but fatally flat Whitney Houston. Small roles to Tomas Arana, as a former colleague of Franks, Mike Starr as one of Rachel’s security, and Richard Schiff as an Oscars-night stagehand, are good to latch onto but the driving force of the film is Kasdan’s overwritten screenplay and that, dear friends, is seriously wanting a polish. While its soundtrack endures for all time, the film itself is less memorable.